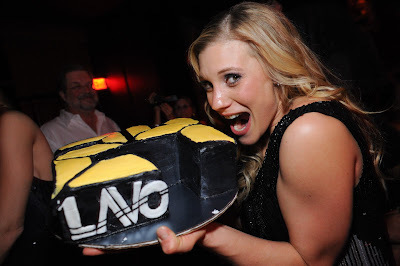 Saturday night Katee Sackhoff hosted at LAVO to celebrate the new season of the TV series “24”. Joined by her parents and friends, including her Battlestar Galactica co-star Tricia Helfer, the vivacious actress sat down to a dinner of LAVO signature items such as the Kobe Meatball and Chicken Parmigiano along with wine and Champagne. After dinner, Sackhoff, who donned a sequined Diane Von Furstenberg dress and much sought after Jimmy Choo stilettos, headed up to a VIP table in the night club where many fans were waiting. Club goers sought out autographs and pictures and Sackhoff happily obliged. She and Helfer kicked off the party with a shot of Patron Tequila and then Helfer presented her with a “24” cake to celebrate the new season. The group had a blast dancing throughout the night to the sounds of DJ Skratchy. They were also spotted dining at TAO on Friday night as part of their Vegas weekend. Also seen at LAVO on Saturday was Bill Rancic, the winner of the first season of “The Apprentice”, and current co-star of “Giuliana and Bill” on the E! and Style Networks. Rancic dined with executives from the E! Entertainment Network, enjoying Grey Goose cocktails along with NY Strip Steak and other favorites.